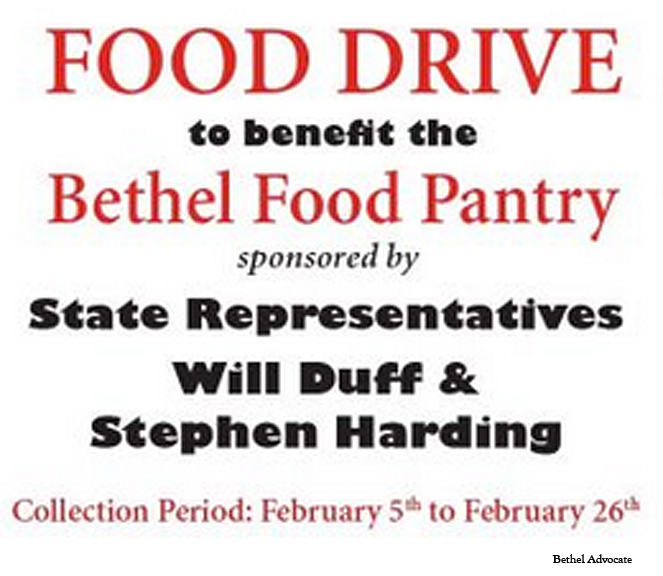 BETHEL- With the cold winter months upon us, State Reps. Will Duff (R-2) and Stephen Harding (R-107) are holding a food drive in the month of February to benefit the Bethel Community Food Pantry and the Bethel families’ in-need. The Bethel Community Food Pantry (BCFP) is a non-profit, community-based, 100 percent volunteer-run food pantry in downtown Bethel. The BCFP provides free food and hygiene items to Bethel residents in need year around. People who are in-need can visit every other Tuesday and choose their own non-perishable food plus bread, fresh fruit and vegetables and, when available, meat and dairy products. The BCFP also offers items not covered by food stamps, such as toilet paper, shampoo, deodorant and laundry detergent. 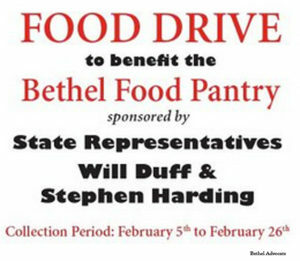 “Please join us in helping the men and women throughout our communities who are most in need by donating a non-perishable item,” Rep. Harding said. Boxes will at the following locations for food donations beginning February 5th – February 26th. For more information, please contact the State Representatives at 1.800.842.1423.